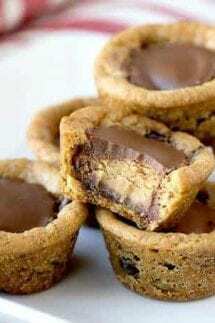 Home » Recipes » Course » Desserts » Reese’s Peanut Butter Chocolate Chip Cookie Bites – 2 ingredients & 15 minutes! You all know me…. I like easy recipes. Well, this one takes the cake… or the cookie (sorry, couldn’t resist!). 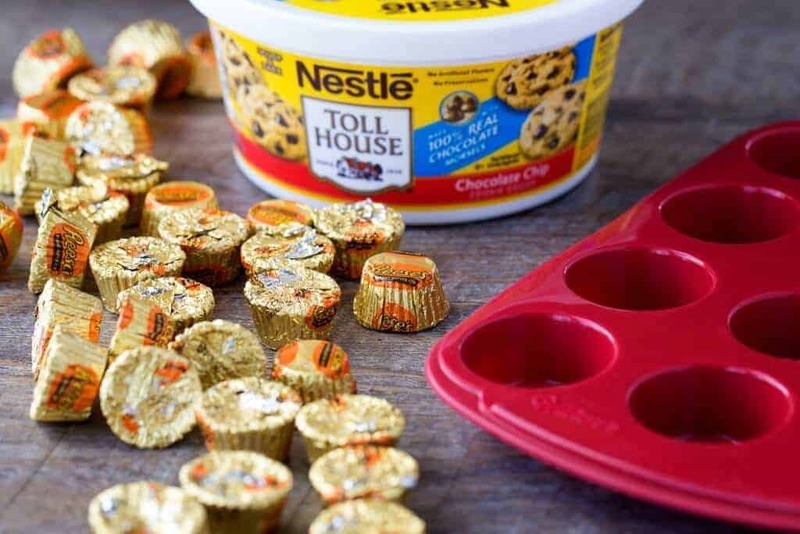 Reese’s Chocolate Chip Cookie Bites – OMG you seriously only need TWO items and they take 10 minutes start to finish – I kid you not!! 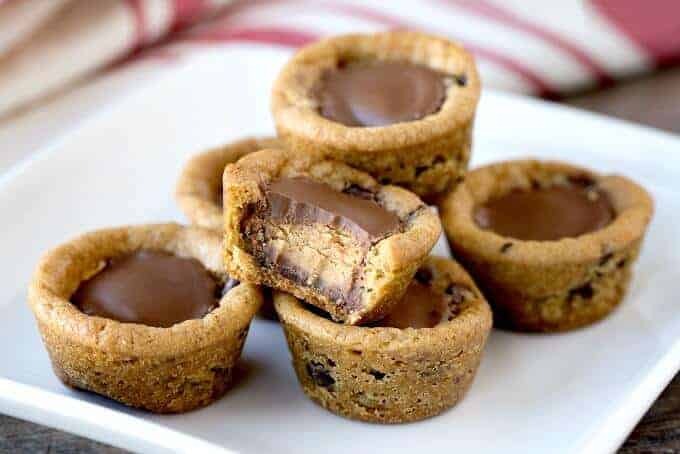 Do you love quick and easy recipes like me- then these Reese’s Peanut Butter Chocolate Chip Cookie Bites are going to be your new BFF? The combination of chocolate and peanut butter is a personal favorite, but stick it in a warm and chewy chocolate chip cookie and this dessert takes a leap to epic level proportions! It never fails, my kids tell me minutes before they are having a group of kids come over or that they need something for their bake sale at 8 PM the night before! So, what do you do? Well, I have a couple of tricks up my sleeve for exactly this occasion. One of my go-to cookie recipes, when I am in a pinch, is our 3-ingredient cake mix cookies! These will literally be ready in under 15 minutes! 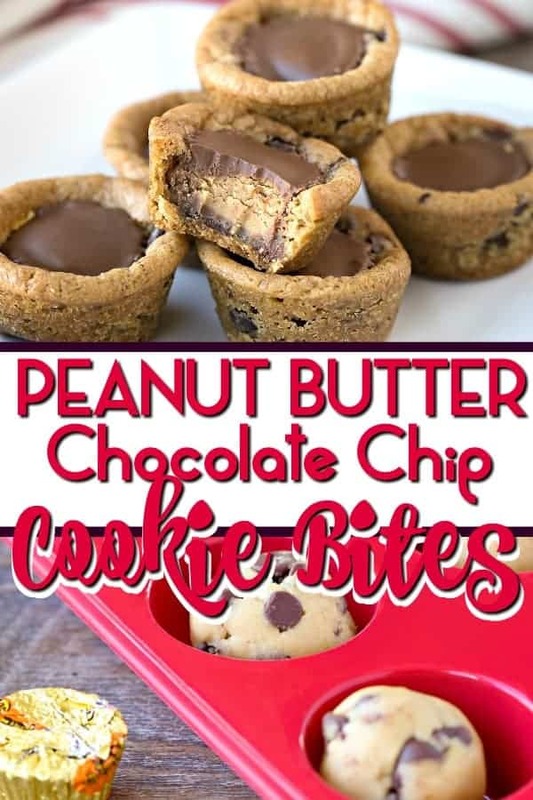 But, if you are looking to take your cookie hacks to the next level, I will tell you a little secret… I keep a container of refrigerated chocolate chip cookie dough and a bag of Reese’s Bite-Sized Peanut Butter Cups in case of a dessert emergency! 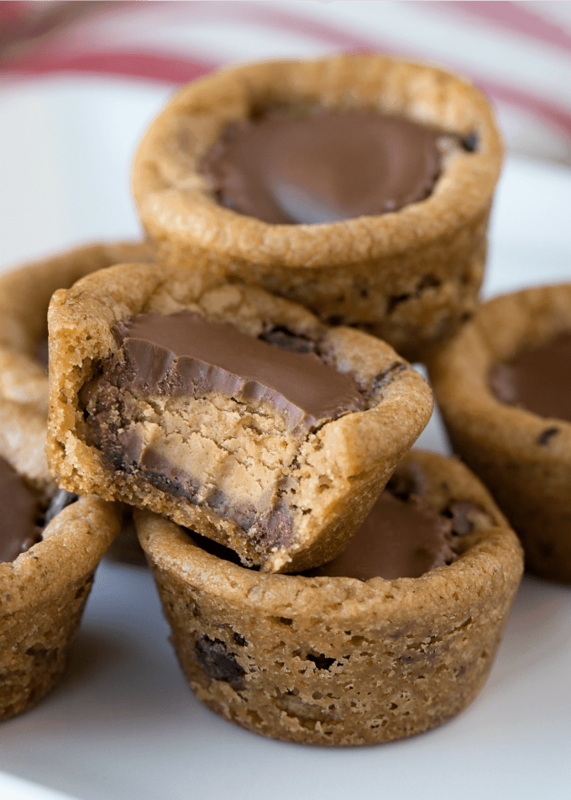 These Peanut Butter Chocolate Chip Cookie Bites will be the best seller at your next bake sale!! Looking for another great chocolate peanut butter cookie? Our soft and chewy, Peanut Butter Blossom Cookies (aka Hershey Kiss Cookies) are the perfect treat to satisfy your chocolate peanut butter fix! That’s right – we have all had dessert emergencies, but if you keep these two items with you at all times, you will always be prepared for that dreaded occasion. How did I learn about this “always be prepared for dessert” hack? So the other night we went out to dinner with our friends, Danny & Sherrie. We decided to go back to their house for dessert – Sherrie said she could whip something up. We told her we didn’t want her to go through the trouble, we could just grab something on the way – she swore to us it really wasn’t any trouble. 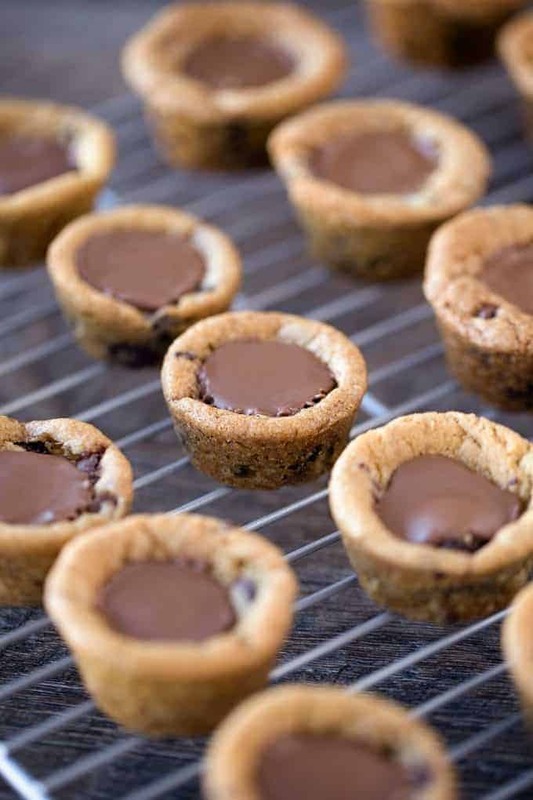 So when Sherrie pulled these Reese’s Chocolate Chip Cookie Bites out of the oven I begged her for the recipe! 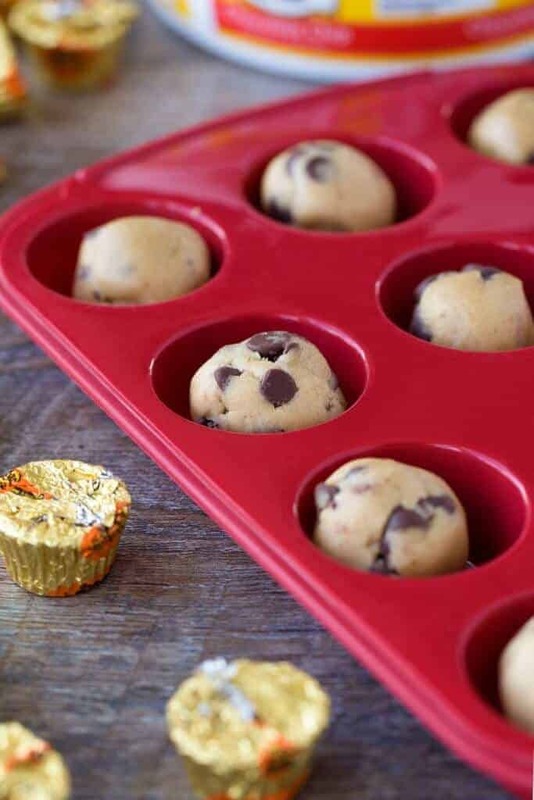 I get asked all the time what kind of mini muffin pan I use because my cups pop out so easily. I live for anything silicon and this is the muffin pan I use! 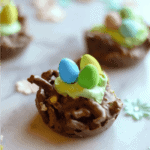 Mini Caramel Apple Crisp Bites – Popular! 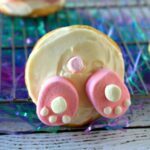 This aren’t bite sized, but it is SUPER EASY and will please a crowd! 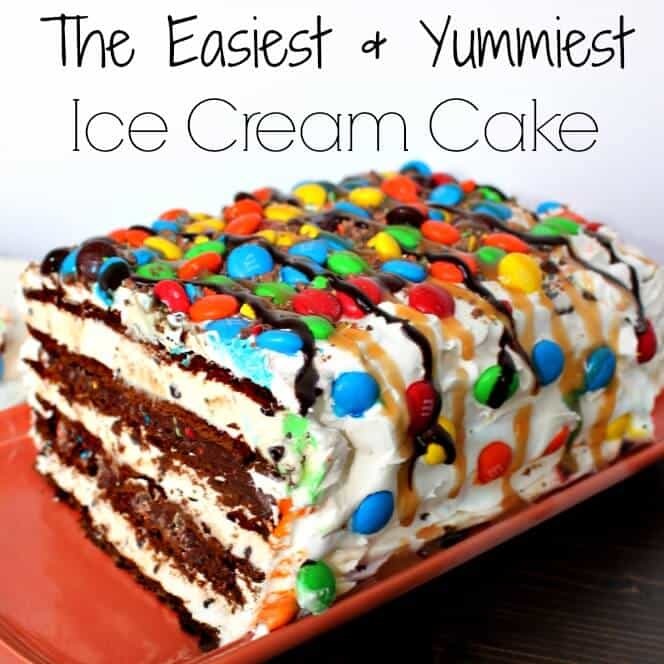 My family just loves this Ice Cream Sandwich Cake – yup, you heard me right. A cake made out of Ice Cream Sandwiches. 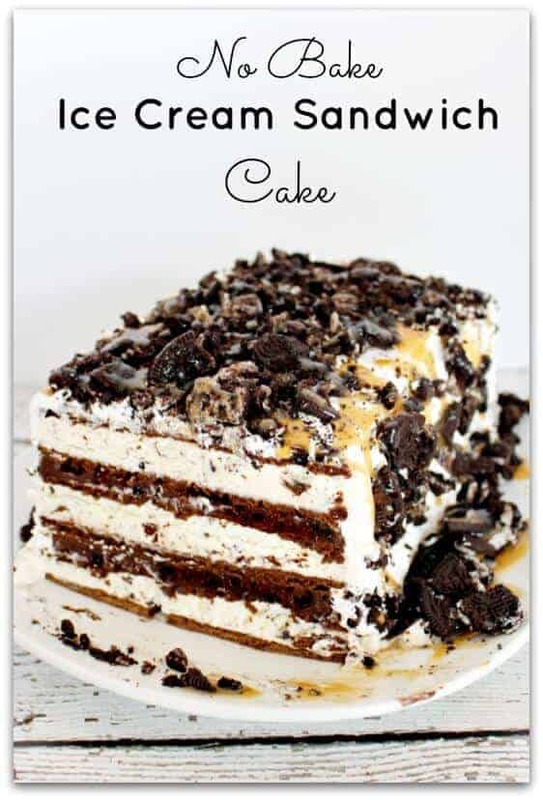 Check out the Oreo version or the No Bake Ice Cream Sandwich Cake! Anything that includes chocolate chip cookie dough is my favorite, especially if it also includes a Reese’s. YUM! YUM! This is sooo crazy simple!! I love it. I can’t wait to make it for Sunday dinner, Thanks! oh my gosh these all look so delicious!!!! I’m so disappointed.. I followed the directions but they fell apart when I tried taking them out of the muffin pan. I tried it in an ungreased pan and a greased pan. They both fell apart. OH NO Janine – I literally just made them and I had no issue! I am so so sorry!!!!! Try adding some more cookie dough next time and maybe cookie them a little longer. Also, wait until they are totally cool. And…. maybe run a knife around the edge before you pop them out. Also – someone else told me they had a similar issue and they got a silicon muffin pan and they worked fine. Mine did as well . Fell into pieces. So upset. I was baking for a fundraiser and now I am stuck with a mess ! ? Oh no Linda! I am so so sorry!!! Did you use a silicon mold? Other’s have said that works well. Mine pop right out of a regular pan. I am super sorry for the mess! I tried to do these about 10 years ago and they stuck to the mini muffin pan. I did not have the silicone pan….So would you lightly spray the pan with no-stick spray? If you have a silicone pan, they shouldn’t stick. If not, for sure spray your pan first. I will use paper muffin liners vs greased cups.